We had quite an exciting day yesterday at our house! Emma Kate, my precious baby girl, started walking!! Both of her brothers walked early. So when she got to be fifteen months old and was still not the least bit interested in doing anything other than crawl, I will admit we were starting to wonder what was up. I would try to get her to walk everyday. I’d hold out my arms to her and plead with her to take just a few steps towards me. Nope. Not interested. She’d plopped her sweet self right on the floor, and then scoot off on her hands and knees. She had just started what the pediatrician called “cruising” around the furniture; which was suppose to be a good sign. But she had to be holding on to something to have the confidence to take a step. Last night she grabbed hold of a pillow on the couch and took a couple of steps away. Then another one. Then another. Before we knew it she was walking all around. Holding on for dear life to the pillow. She obviously thought it was holding her up. And with that pillow in hand, she had all the confidence in the world. We’d take it from her and she would sit right down and revert back to a crawl. Finally, as the night came to an end she tossed the stick to the ground and took off walking by herself! And not a timid stumble here and there. She was walking confidently and strongly – taking big strides and making impressive turns without falling. We clapped and praised her accomplishment and she clapped for herself – grinning from ear to ear. Watching my little one reinforced something significant to me. It reminded me that Emma Kate could walk long before she knew she could. She had the physical ability to do it. She had the strength and the stamina. The only thing holding her back was the fact that she didn’t believe she could. Once she gained a little confidence – first with the pillow and then with the stick – she realized her own strength and ability and was able to take off with a vengeance. Needless to say, she hasn’t sit still all day today! It’s like she’s discovered a new talent; an exciting new “power” she possesses that she’s proud of and anxious to use. I think this is an important question to ask ourselves. What’s holding you back? What are you capable of that you haven’t even let your heart and mind realize? Put down your pillow and “magic walking stick” and take off for whatever it is you want to achieve or be! It’s been within you all along. You just need to put action to your steps. Grab your oxygen mask first! 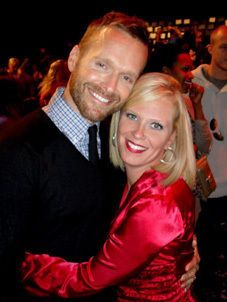 I learned so many things through my “Biggest Loser” experience. And Jillian Michaels made a profound impact on my life. One of the most powerful truths she instilled in me (and all of us who were trained by her) was that “self” is not a bad word. Sometimes in the society we live in, we are made to feel like it is. I’m thinking particularly in my role as a mom, it is essential (most of the time) to put my kids before myself. But I heard a great analogy today that reinforced the opinion that you don’t have to be self-ISH to make yourself a healthy priority. And I think there’s a big difference. Wow, how true is that! In other words, if we are not getting enough “oxygen” for ourselves how can we possibly be healthy and high-functioning for others? What is your oxygen? Maybe it’s quiet time alone to gather your thoughts as each day begins. Or maybe it’s going for a run to get the endorphins in your brain pumping. It could be taking the time to plan healthy menus, or reading a really great book, or soaking in a hot tub. Or maybe it’s something as simple as sitting out on the porch at the end of the day and reflecting, or praying, or just listening. Whatever the oxygen is in your life…I encourage you to “grab your oxygen mask first” – and by taking care of yourself, you will be so much better prepared to help those whom you love the most! 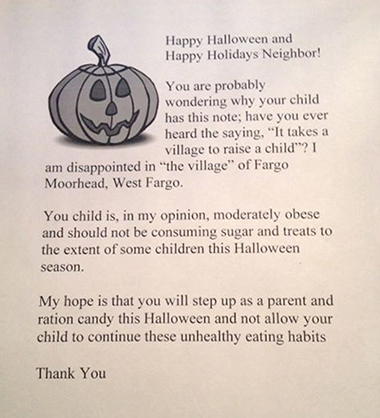 A “Fat Warning Letter” to kids instead of candy on Halloween? I don’t think so. My mind is still spinning from the story I heard this morning about a woman in Fargo, North Dakota, who told a local radio station that she plans to “trick” obese children in her hometown by giving them “warning letters” about their weight, instead of “treats” of the normal candy variety tomorrow night. The thought sends me immediately back to my own chubby childhood when I was the brunt of a lot of jokes and ridicule because of my weight. A stunt like this would not have motivated me as a child. It would have mortified me! It would have forced me further into the secret world of snacking behind closed doors and urged me towards a lower self-esteem and self-worth. I want to ask this woman who does she think she is? And what gives her the right to impose this kind of indictment on children that aren’t even hers’? And does she realize that she can’t accurately assess the “health” of a child based solely upon a cursory glance at the door? There are “skinny fat people” walking around all over the place! 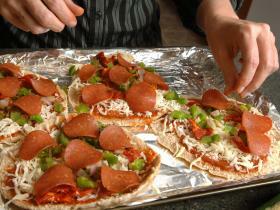 Skinny does not necessarily equate to healthy! Don’t get me wrong — I totally agree that the obesity epidemic in America has hit all new heights; especially in our kids. And I don’t believe that Halloween or other candy-center holidays do anything to help refocus our minds and our habits on healthy choices. But I don’t believe that cruelty to children is going to do anything to cure childhood obesity! Rather than taking it upon herself to be the judge and jury for children in her North Dakota neighborhood, I would much prefer to see her hand out healthy nutritious snacks. Or here’s a novel idea —just don’t answer the door. As parents (and adults in general) let’s be diligent about teaching the kids in our lives about nutrition and healthy choices. But as one who lived the roll of the fat kid, please do it constructively. Words have the power to bring life or death. Take that power seriously and use it responsively to affect a positive change in the lives of the children you have influence over. Abercrombie & Fitch thinks you have to be skinny to be cool? Think again. The headline “Abercrombie & Fitch targets skinny shoppers, won’t sell larger sizes for plus-sized women” caught my eye this week. In fact, the subject has been all over the Internet, so I decided to finally weigh in on the topic (pun intended). I have been a size 2 and I have been a size 22, and to be honest A& F has never been on my list of frequently visited stores. They are just not my style, regardless of my size. But I have a 12 year-old son (going on 21 in his own mind) who does like their clothing. Basically, if you are bigger than a size large, don’t bother shopping at A& F. They don’t want you to and you won’t find anything there to fit. They have XS on the racks, but not XL (for women). And that’s ok. In America we are free to conduct business in whatever way we chose. And likewise, we are free – as consumers – to shop anywhere we choose. I don’t take issue with A&F’s right to engage any marketing strategy they choose; nor do I critique Jeffries’ right to take any stance he wants. What I do find unfortunate, is that in this image-conscious, media-driven society we live in, that all the buzz about A&F not selling clothes to “normal sized” healthy people (over a size 10), means they are alienating a group of very impressionable kids who are developing body image issues every day. And these issues go far beyond just being frustrated because they can’t fit into a cool pair of trendy jeans. These issues penetrate into the deepest core of their beings and affect the way they see themselves and value themselves. And as superficial as something like this may sound, it affects (in some people) the course they choose for their future. The most important thing I learned from my “Biggest Loser” experience is that I am WORTH the effort to live the life I’ve always dreamed of. We all are! And that worth is NOT linked to a number on a scale, or the brand name on my shirt or jeans. And although controversy with the A&F brand is nothing new [I mean seriously, some of their ads feature so many naked bodies, you’d wonder if they are selling clothes or something else] I do hope that we as parents and adults-of-influence in the lives of kids will use all our influence to positively affect their lives and their developing self images. And as a mom of three kids…cool or not (the verdict is still out), I’ll probably spend my money at Target. 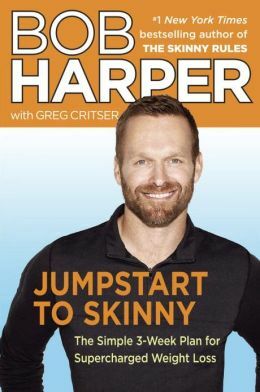 • I know Bob Harper personally. I believe these two things to be true about him: 1) He knows what he’s talking about. 2) He genuinely cares about people. • I don’t believe the whole 800-calories-a-day concept is something you can live with permanently. But I don’t believe that’s what he’s suggesting. This is a jump start. And sometimes we all need a swift kick in the pants to help get us back on track. • I think as long as you follow the formula: 20% of your calories coming from fat, 40% from carbohydrates and 40% from protein – you will be safe and not doing anything detrimental to your body. • As far as gaining the weight back quickly, I was able to maintain a healthy body weight for five years (until getting pregnant) after using this technique initially (not permanently) to get to where I wanted to be. So as long as you keep proper perspective I don’t think re-gaining everything is unavoidable. • Now when it comes to the word “Skinny”…let me go on the record as saying I would NOT be offended if anyone wanted to use that term to refer to me. 🙂 But I do agree “healthy” is a better choice. So those are my thoughts. I welcome yours’. I’ve shared this story before, but it’s one I need to remind myself of sometimes so I want to share it again here. It’s the story of two dogs: Marty and Sam. Marty, is a Miniature Schnauzer and Sam, is a yellow Labrador Retriever. They both belong to my pastor and he shared this in a sermon a while back and it really made an impression on me. When Sam was a puppy, Marty would exercise his dominance as the “alpha male” and eat his dog food and then go over and eat Sam’s too. Now, many, many months have passed, and Sam outweighs Marty by almost four times his body weight. But guess what happens when Marty finishes his own food? He goes over to Sam’s bowl and Sam cowers down in fear as Marty proceeds to gobble up both bowls. Sam reverts back to the mentality of a six-week-old puppy. Even though his size and strength far exceeds Marty’s now; he has a defeated mindset that he can’t overcome. But there’s got to be a delicate balance in our thinking. The fact is the past isn’t all bad. I believe we should use the past; both the positive and negative – to build us up and prepare us for the future. I hear from people a lot who share stories about feeling defeated in their attempts to lose weight or make changes in their lives. They are scared of change, and they are defeated by their past. I try to encourage them to just take that first step to move beyond the past and into the future. Whenever you begin to make changes in life, it may be scary but more than that it’s going to be exciting. Sometimes when you begin to make those changes things feel beyond your control. But when that happens, just remember that God is in control – His strength is made perfect in our weakness. Rest in that reality and make a change today that will impact all your tomorrows!